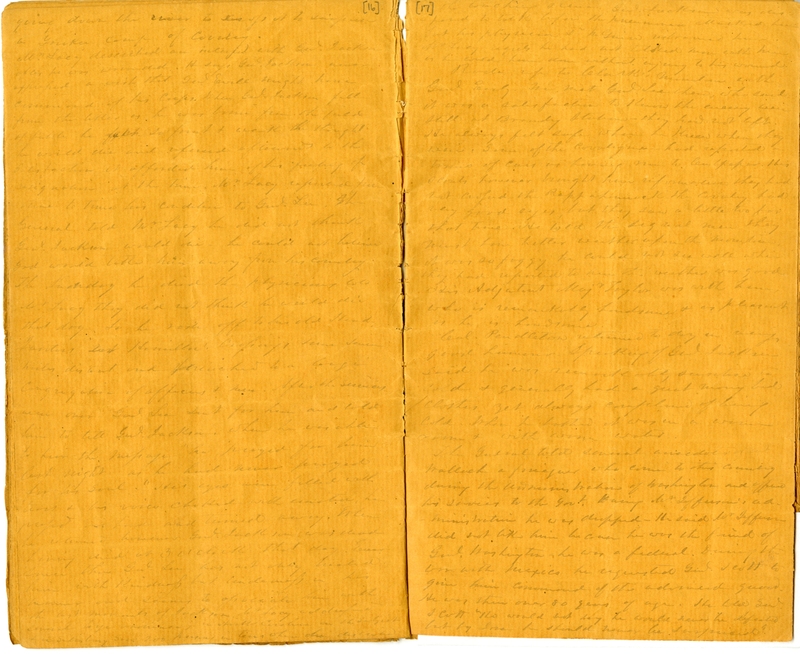 Item Description: Diary entry, 18 November 1863, written Peter Wilson Hairston (1819-1886), a tobacco planter of southwestern Virginia and north central North Carolina, Confederate soldier, and commission merchant. The entry discusses movements of the Confederate army, third party reminiscences of the death of Stonewall Jackson, and the story of a young girl who knit socks for Robert E. Lee. 18 During the night Gen’l Hayes reported he heard artillery move down the river that night Early this morning Gen’l Long came down to see Gen’l Early about posting some artillery in front to have it ready should it be needed. The only difficulty was the distance forage had to be hauled but this was neither here nor there if they were needed in front. 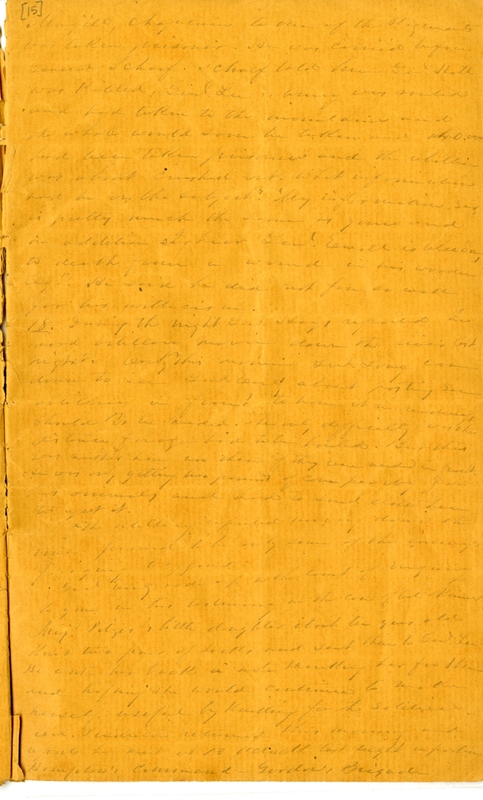 He was only getting two pounds of corn per day for his animals and had to send … to get it. The artillery corporal reported moving down the water … to be only some of the enemy’s foraging wagons. Gen’l Early rode up to the … of engineering to give in his testimony in the case of Col. Skinner. Maj. Pitzer’s little daughter about ten years old knit two pairs of socks and sent them to Gen. Lee. He sent her back a note thanking her for them and hoping she would continue to make herself useful by knitting for the soldiers. Col. Pendleton returned this morning and reported he met at 12 o’clock last night a portion of Hamilton’s command, Gordon’s Brigade, going down the river to offset the surprise a Yankee camp of cavalry. 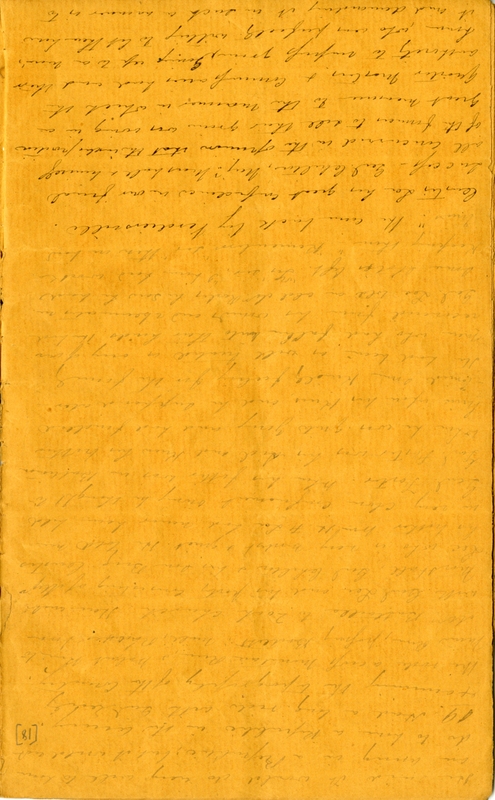 Mr Lacy described an interview with General Jackson after he was wounded. He said General Jackson never expressed a wish that General Ewell might have command of his corps. When General Jackson fell from the … and was borne from the field of battle he felt so faint and weak the thought he would die and referred afterward to the satisfaction it afforded him of his feeling of resignation at the time. Mr. Lacy reported from time to time his condition to Gen’l Lee. The general told Mr. Lacy he did not think Gen’l Jackson would die. He couldn’t believe god would take him away from his country. The Sunday he died, the physician told Mr. Lacy they did not think he would die that day, so he rode off to his old headquarters at Hamilton Hill, some seven miles, and preached to a large congregation of officers and men. After the services were over Gen’l Lee sent for him and told him to tell Gen’l Jackson when he was able to hear the message “he prayed for him last night as he had never prayed for his soul.” His eyes were filled with tears and his words choked with emotion. His head was turned away. When he returned, however, Gen’l Jackson was dead, having died at 3 o’clock that day. Ever since then, Gen’l Lee has not only treated him with kindness but tenderness in his … and seems to associate him with the last moments of Jackson. Mr. Lacy will defend several boys … in South Carolina, on the subject in Salisbury some 200 people in tears when he described the touching scene when Gen’l Jackson was disposed to talk before the pneumonia attacked him but his physician Dr. McGuire informed him. Rode up to Clark Mountain with Gen’l Early. We met Gen’l Lee there, who said it was a satisfaction to know the enemy was still in Brandy Station. They had not left. He always felt safer when he knew where they were. Some of the cavalrymen had reported a train of cars on having run to Culpepper. His scouts however brought him information they had not crossed the Rappahonnock. The cavalry had very good eys but they saw a little too far that time. He told the signal me they must have better weather upon the mountain, it was so foggy he could not see well when they had reported to him the weather was good. His adjutant, Major Taylor, was with him. He is remarkably handsome and as pleasant as he is handsome. Col. Pendleton returned to day in a very good humour. Speaking of Genl Jackson said he was remarkably sensitive to cold and generally had a great many bed clothes yet always complained of being cold. When he bathed it was in a warm room & with warm water. The General told several anecdotes of Count Walluch a foreigner who came to this country during the administration of Washington and offered his services to the Govt. During Mr. Jefferson’s administration he was dropped. He said Mr. Jefferson did not like him because he was the friend of Genl Washington- he was a federal. During the war with Mexico he requested Genl Scott to give him command of the armed guard. He was then over 80 years of age. He told Gen’l Scott “he would not say he would never be defeated but by jove he should never be surprised.” He said he would do very well to have an army in a Republic; but it would not do to have a Republic in the army. 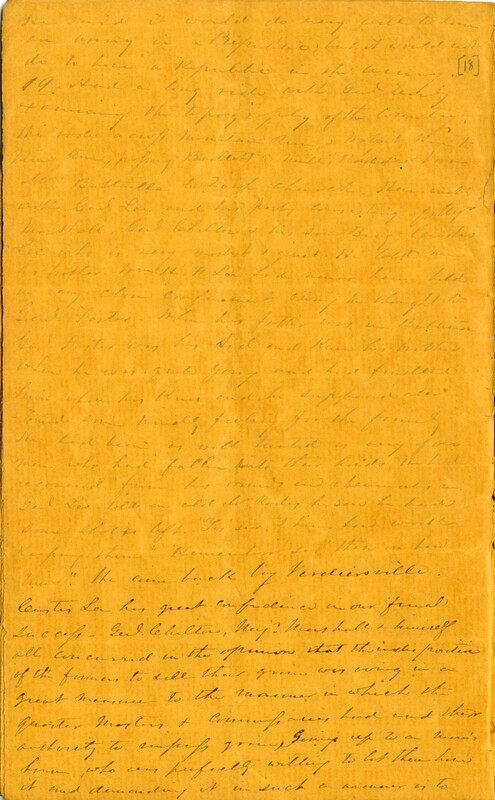 This entry was posted in Southern Historical Collection and tagged Confederate Army, diaries, Gen. Stonewall Jackson, General Robert E. Lee, Peter Wilson Hairston. Bookmark the permalink.